Isometric puzzle games pretty much have me at hello. There’s something about the lovely god-like viewpoint that gives me a sense of wonder, in addition to a strict sense of control, that I really dig. Monument Valley ($3.99) is pretty much the king of the mobile space when it comes to those experiences, yet a number of games have risen to the call and have cemented themselves as worthy adversaries. While Mekorama (Free) isn’t as attractive when it comes to its art style (the base game clocks in at just 8MB! ), it makes up for it in charm, and a pretty nifty level editor. 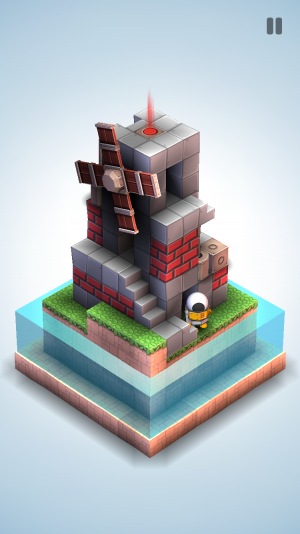 Unlike a lot of other daunting puzzle games, Mekorama is highly accessible. You’ll control a little robot as he embarks upon a journey to a set goal location, controlling him by tapping where you want to head to. Since each space is broken up in a grid-like fashion, it’s easy to figure out exactly where the robot needs to go by tapping an individual square. There’s pretty much no room for error, even on a device with less screen real estate. If I had one criticism regarding the camera though, it would be that the zoom function is a little too basic. By pinching to zoom you can get closer to the action, but unfortunately there’s no way to focus in on the character itself — so often times zooming in is pointless. The high focus on verticality allows for some pretty cool concepts, to be sure. There’s levels where you’ll descend underwater in attempt to locate a goal obfuscated by liquid, and challenges where one might have to take a leap of faith to drop to a lower platform. You can’t just tap anywhere and automatically win either — players will need to flip the camera angle around and look at every possible angle to make their way to the end. When tools and other objects enter the picture, it becomes more than just a point and click affair. As a side note, I really love how the little guy sways his arms and flails around when moving — it’s a great touch. The best part isn’t the official set of levels though (of which there are 50, and last a long, long while), it’s the QR custom design aspect. Yep, the game allows you to create a level, create an QR code, and then scan a creation in. This is important for myriad of reasons, most notably the fact that it allows for players to craft a series of stages with one united theme. I had a go at it myself, creating several levels that all had a big focus on going underwater constantly in an attempt to disorient people. Again, it’s the little touches that make this game, and the “title cards" for every creation that list the name of the level and the author beside a visual snapshot representation are amazing. Go ahead and check out our official forum topic to get some ideas — there’s a lot of really great ones in there. While Mekorama couldn’t be more endearing even if it tried, it somehow manages to top itself with its “pay what you want" scheme. Yep, you can download the entire game for free, no questions asked, and if you like it, you can “tip" the developer with as little as a $0.99 purchase all the way up to $31.99. The higher end isn’t even anything to scoff at either, because if the community continues to make fun levels day in and day out, you’ll likely get your money’s worth there. After playing game after game with predatory IAP tied to crucial meters or gameplay mechanics, it’s refreshing to see something like this out there, and I hope it works out. A lot of passion went into this “pay what you want" project, and I highly suggest checking it out. Mekorama might not wow you from minute-one with incredible visuals, but once you start getting addicted to the QR creation aspect, you may not be able to put it down or a while. I would absolutely be up for a sequel with new mechanics and the same focus on sharing levels with the community.